It was one of those lovely days in the high summer of 2016, and I came here from Norfolk with my friend John. We came through the beautiful coolness of the Forest, hundreds of shades of light green dappling the glades either side of the road, almost all the way to Elveden. In the thirteen years that had passed since my last visit to this church, something rather wonderful had happened to the village, and to its grand church. When I'd come this way before I had taken my life in my hands to cross the road, for the A11 main road between London and Norwich passed through the village, becoming its main street. The traffic was slowed to a mere 50 mph, although it was often much slower than that thanks to Elveden being a bottleneck, which was probably just as well. If a car hits you at 50 mph, you are not going to survive. As you approach Elveden, there is Suffolks biggest war memorial, to those killed from the three parishes which meet at this point. It is over 30 metres high, and you used to be able to climb up the inside. Someone in the village once told me that more people had been killed on the road in Elveden since the end of the War than there were names on the war memorial. I could well believe it. But now the village has been bypassed, and it was a pleasure to wander across the village street and enter a churchyard full of birdsong rather than of traffic fumes. If Elveden church is no longer a landmark on the journey between London and Norwich, then this is an accolade which it can well do without. And in any case, those swept along in the stream of traffic were unlikely to appreciate quite how extraordinary a building this is. For a start, it has two towers. 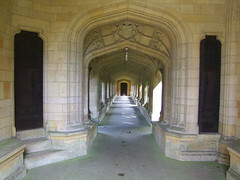 And a cloister. And two naves, effectively. And yet if you had seen this church before the 1860s, you would have thought it nothing remarkable. 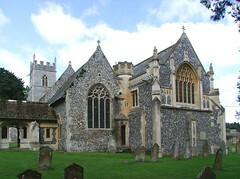 A simple aisle-less, clerestory-less building, typical of, and indistinguishable from, hundreds of other East Anglian flint churches. But it was to undergo three fabulously bankrolled building programmes in the space of thirty years, any one of which would have sufficed to transform it utterly. The story of the transformation of Elveden church begins in the early 19th century, on the other side of the world. The leader of the Sikhs, Ranjit Singh, controlled a united Punjab that stretched from the Khyber Pass to the borders of Tibet. His capital was at Lahore, but more importantly it included the Sikh holy city of Amritsar. The wealth of this vast Kingdom made him a major power-player in early 19th century politics, and he was a particular thorn in the flesh of the British Imperial war machine. At this time, the Punjab had a great artistic and cultural flowering that was hardly matched anywhere in the world. It was not to last. The British forced Ranjit Singh to the negotiating table over the disputed border with Afghanistan, and a year later, in 1839, he was dead. A power vacuum ensued, and his six year old son Duleep Singh became a pawn between rival factions. It was exactly the opportunity that the British had been waiting for, and in February 1846 they poured across the borders in their thousands. Within a month, almost half the child-Prince's Kingdom was in foreign hands. The British installed a governor, and started to harvest the fruits of their new territory's wealth. Over the next three years, the British gradually extended their rule, putting down uprisings and turning local warlords. Given that the Sikh political structures were in disarray, this was achieved at considerable loss to the invaders - thousands of British soldiers were killed. They are hardly remembered today. British losses at the Crimea ten years later were much slighter, but perhaps the invention of photography in the meantime had given people at home a clearer picture of what was happening, and so the Crimea still remains in the British folk memory. For much of the period of the war, Prince Duleep Singh had remained in the seclusion of his fabulous palace in Lahore. However, once the Punjab was secure, he was sent into remote internal exile. The missionaries poured in. Bearing in mind the value that Sikh culture places upon education, perhaps it is no surprise that their influence came to bear on the young Prince, and he became a Christian. A year later, he sailed for England with his mother. He was admitted to the royal court by Queen Victoria, spending time both at Windsor and, particularly, in Scotland, where he grew up. In the 1860s, the Prince and his mother were significant members of London society, but she died suddenly in 1863. He returned with her ashes to the Punjab, and there he married. His wife, Bamba Muller, was part German, part Ethiopian. As part of the British pacification of India programme, the young couple were granted the lease on a vast, derelict stately home in the depths of the Suffolk countryside. This was Elveden Hall. He would never see India again. With some considerable energy, Duleep Singh set about transforming the fortunes of the moribund estate. Being particularly fond of hunting (as a six year old, he'd had two tutors - one for learning the court language, Persian, and the other for hunting to hawk) he developed the estate for game. The house was rebuilt in 1870. The year before, the Prince had begun to glorify the church so that it was more in keeping with the splendour of his court. 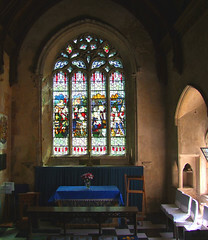 This church, dedicated to St Andrew, was what now forms the north aisle of the present church. There are many little details, but the restoration includes two major features; firstly, the remarkable roof, with its extraordinary sprung sprung wallposts set on arches suspended in the window embrasures, and, secondly, the font, supported by eight elegant columns. 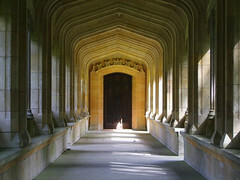 Mortlock tells us it is in the Sicilian-Norman style. Duleep Singh seems to have settled comfortably into the role of an English country gentleman. And then, something extraordinary happened. The Prince, steeped in the proud tradition of his homeland, decided to return to the Punjab to fulfill his destiny as the leader of the Sikh people. He got as far as Aden before the British arrested him, and sent him home. He then set about trying to recruit Russian support for a Sikh uprising, travelling secretly across Europe in the guise of an Irishman, Patrick Casey. In between these times of cloak and dagger espionage, he would return to Elveden to shoot grouse with the Prince of Wales, the future King Edward VII. It is a remarkable story. Ultimately, his attempts to save his people from colonial oppression were doomed to failure. He died in Paris in 1893, the British seemingly unshakeable in their control of India. 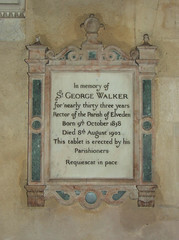 He was buried at Elveden churchyard in a simple grave. 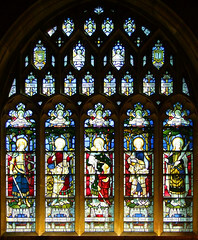 The chancel of the 1869 church is now screened off as a chapel, accessible from the chancel of the new church, but set in it is the 1894 memorial window to Maharaja Prince Duleep Singh, the Adoration of the Magi by Kempe & Co. Curiously, one of the Magi has a real portrait face. It isn't Duleep Singh, so who could it be? And so, the Lion of the North had come to a humble end. 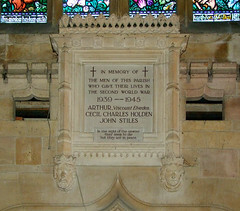 His five children, several named after British royal princes, had left Elveden behind; they all died childless, one of them as recently as 1957. The estate reverted to the Crown, being bought by the brewing family, the Guinnesses. Edward Cecil Guinness, first Earl Iveagh, commemorated bountifully in James Joyce's 1916 Ulysses, took the estate firmly in hand. The English agricultural depression had begun in the 1880s, and it would not be ended until the Second World War drew the greater part of English agriculture back under cultivation. It had hit the Estate hard. 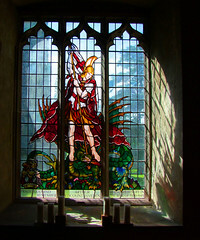 But Elveden was transformed, and so was the church. Iveagh appointed William Caroe to build an entirely new church beside the old. 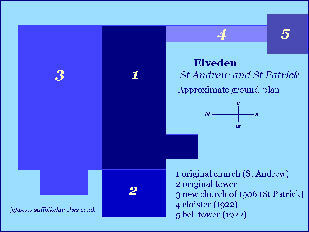 It would be of such a scale that the old church of St Andrew would form the south aisle of the new church. The size may have reflected the Iveaghs' visions of grandeur, but it was also a practical arrangement, to accommodate the greatly enlarged staff of the estate. Attendance at church was compulsory; non-conformists were also expected to go, and the Guinnesses did not employ Catholics. Between 1904 and 1906, the new structure went up. Mortlock recalls that Pevsner thought it 'Art Nouveau Gothic', which sums it up well. 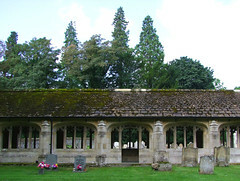 Lancet windows in the north side of the old church were moved across to the south side, and a wide open nave built beside it. Click on the plan to the right to see an enlarged version. Curiously, although this is much higher than the old and incorporates a Suffolk-style roof, Caroe resisted the temptation of a clerestory. 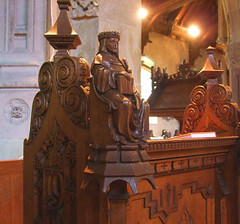 The new church was rebenched throughout, and the woodwork is of a very high quality. 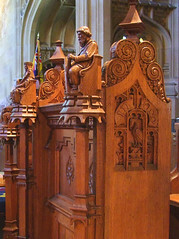 The dates of the restoration can be found on bench ends up in the new chancel, and exploring all the symbolism will detain you for hours. The new church was dedicated to St Patrick, patron Saint of the Guinnesses' homeland. At this time, of course, Ireland was still a part of the United Kingdom, and despite the tensions and troubles of the previous century the Union was probably stronger at the opening of the 20th century than it had ever been. This was to change very rapidly. From the first shots fired at the General Post Office in April 1916, to complete independence in 1922, was just six years. Dublin, a firmly protestant city, in which the Iveaghs commemorated their dead at the Anglican cathedral of St Patrick, became the capital city of a staunchly Catholic nation. 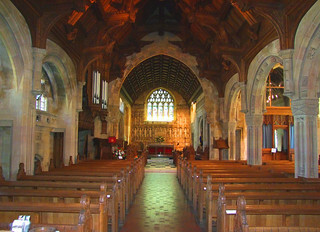 The Anglicans, the so-called Protestant Ascendancy, left in their thousands during the 1920s, depopulating the great houses, and leaving hundreds of Anglican parish churches completely bereft of congregations. Apart from a concentration in the wealthy suburbs of south Dublin, there are hardly any Anglicans left in the Republic today. 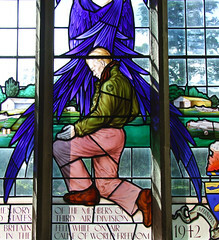 But St Patrick's cathedral maintains its lonely witness to long years of British rule; the Iveagh transept includes the vast war memorial to WWI dead, and all the colours of the Irish regiments - it is said that 99% of the Union flags in the Republic are in the Guinness chapel of St Patrick's cathedral. Dublin, of course, is famous as the biggest city in Europe without a Catholic cathedral. 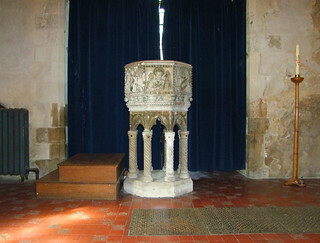 It still has two Anglican ones. Against this background then, we came to Elveden. 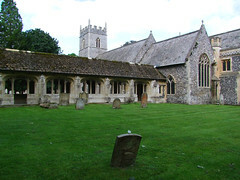 The church is close to the road, looking entirely 19th Century apart from the tower from this side. 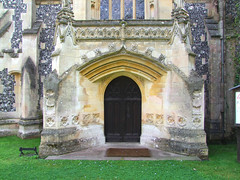 The main entrance is now at the west end of the new church. The surviving 14th century tower now forms the west end of the south aisle, and we will come back to the other tower beyond it in a moment. You step into a wide open space under a high, heavy roof laden with angels. 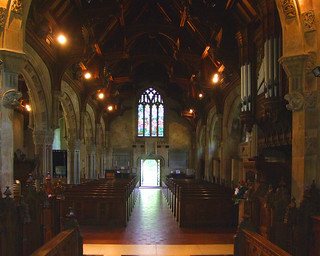 There is a wide aisle off to the south; this is the former nave, and still has something of that quality. 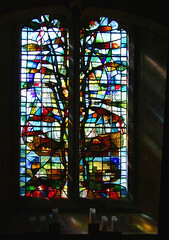 The whole space is suffused with gorgeously coloured light from 19th and 20th century windows. These include work by Kempe & Co, Hugh Easton, Laurence Lee but most all one by Frank Brangwyn, at the west end of the new nave. 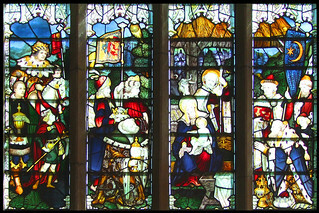 Depicting Charity and Education, it shows Saints Andrew and Patrick look down from a heavenly host on a mother and father entertaining their children and a host of woodland animals by reading them stories. It is quite the loveliest thing in the building. 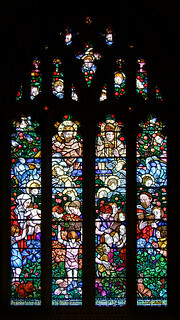 The other windows are mostly in the south aisle. 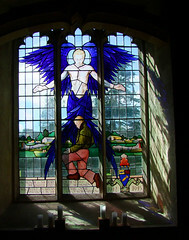 Hugh Easton's commemorative window for the former USAAF base at Elveden depicts an angel sheltering an American airman, his plane and the airbase behind him. 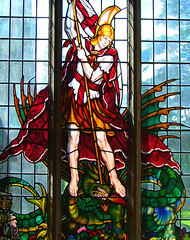 Either side are windows to Iveaghs - St George kills a dragon to the east, also by Hugh Easton, and to the west is Laurence Lee's abstract of 1971 depicting images from the lives of Edward Guinness's heir and his wife. 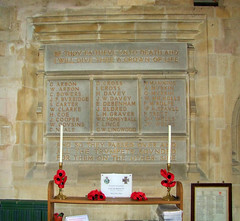 The parish war memorials are on the west wall, with twenty-nine names for the First World War and just two for the second. The churchwarden told me how moving the first two minute silence after the bypass was opened was. 'It was the first time we've ever had a proper silence', she said poignantly. 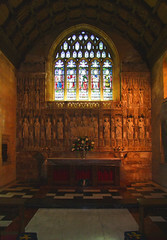 Turning back east towards the new chancel, there is the mighty alabaster reredos. It cost £1,200 in 1906, about a quarter of a million in todays money. It reflects the woodwork, in depicting patron Saints and East Anglian monarchs, around a surprisingly simple Supper at Emmaus. This reredos, and the Brangwyn window, reminded me of the work at the Guinnesss other spiritual home, St Patricks Cathedral in Dublin, which also includes a window by Frank Brangwyn commisioned by them. Everything is of the highest quality. Rarely has the cliché no expense spared been as accurate as it is here. Up at the front, a little brass plate reminds us that Edward VII slept through a sermon here in 1908. How different it must have seemed to him from the carefree days with his old friend the Maharajah! Still, it must have been a great occasion, full of Edwardian pomp, and the glitz that only the fabulously rich can provide. Today, the church is still splendid, but the Guinesses are no longer fabulously rich, and attendance at church is no longer compulsory for estate workers; there are far fewer of them anyway. The Church of England is in decline everywhere; and, let us be honest, particularly so in this part of Suffolk, where it seems to have retreated to a state of siege. Today, the congregation of this mighty citadel is as low as half a dozen. The revolutionary disappearance of Anglican congregations in the Iveaghs' homeland is now being repeated in a slow, inexorable English way. You wander outside, and there are more curiosities. Set in the wall are two linked hands, presumably a relic from a broken 18th century memorial. They must have been set here when the wall was moved back in the 1950s. In the south chancel wall, the bottom of an egg-cup protrudes from among the flints. This is the trademark of the architect WD Caroe. To the east of the new chancel, Duleep Singhs gravestone is a very simple one. It is quite different in character to the church behind it. 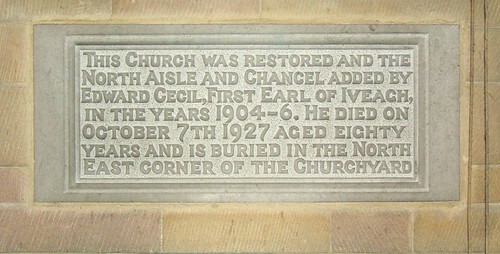 A plaque on the east end of the church remembers the centenary of his death. Continuing around the church, you come to the surprise of a long cloister, connecting the remodelled chancel door of the old church to the new bell tower. It was built in 1922 as a memorial to the wife of the first Earl Iveagh. 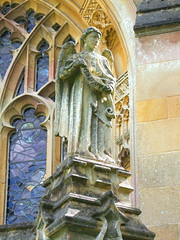 Caroe was the architect again, and he installed eight bells, dedicated to Mary, Gabriel, Edmund, Andrew, Patrick, Christ, God the Father, and the King. The excellent guidebook recalls that his intention was for the bells to be cast to maintain the hum and tap tones of the renowned ancient Suffolk bells of Lavenham... thus the true bell music of the old type is maintained. 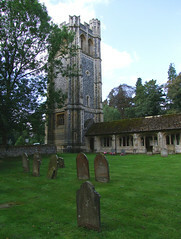 The bell tower has a double purpose, for to the south of it we leave the churchyard and enter the grounds of Elveden Hall. The Iveaghs would come by carriage from the Hall on a Sunday, dismount in the space beneath the tower and walk along the cloister to enter the church. St Andrew and St Patrick is magnificent, obviously enough. It has everything going for it, and is a national treasure. And yet, it has hardly any congregation. So, what is to be done? 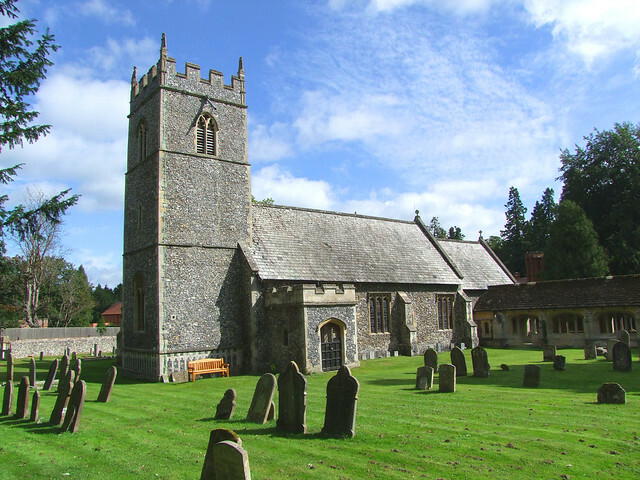 If we continue to think of rural historic churches as nothing more than outstations of the Church of England, it is hard to see how some of them will survive. This church in particular has no future in its present form as a village parish church. New roles must be found, new ways to attract visitors, involve local people and encourage new uses. One would have thought that this would be easier here than elsewhere, although I am afraid I must report, as an end-note, that this church is still kept locked without a keyholder notice.